Ask Dr. Z - Your Personal Portable Oxygen/O2 Bar-Concentrator - Why do I need more Oxygen/O2? Young, Happy and Healthy into Old Age. Q: Why do I need more OXYGEN? A: Your brain is in charge of every aspect your being – mental and physical. 1. Oxygen/O2 is critical. Your brain depends on adequate oxygen, perhaps more than any other part of your body. 2. You derive oxygen/O2 from the air you breathe. 3. Our air is much worse now and more and more polluted. 4. Most people don't breathe deeply. 5. As you age, you lose some of our capacity to utilze oxygen/O2, approx. 1% per year from the age of 20. 6. The older you get, the more oxygen deficiency becomes an issue. 7. Flood your body with more oxygen by using your Personal Portable Oxygen/O2 Bar-Concentrator. Q: What possible benefits may I expect from my Personal Portable Oxygen Bar? Q: I found oxygen concentrators on the Internet that put out 95% oxygen. Your Personal Portable Oxygen Bar creates only 40% oxygen. Wouldn't it be better to breathe 95% oxygen? A: I get that question a lot. Lots of people, especially in the USA, think that MORE is better. Let me ask YOU: if the oxygen content in the normal air you breathe is between 20% and 21%, do you think that it is wise to all of sudden breathe air with 95% oxygen? My answer is: Absolutely Not! This is like using a sledgehammer where a gentle approach is much more useful and appropriate. There are many advantages and some disadvantages with the Internet. There are people who will sell you anything to make a buck. There such a thing as a Oxygen Toxicity - when you get too much oxygen into your body… NOT a good thing. During the past 25 years I have always searched for ways to optimize the health of myself, my family, my patients and online clients with gentle, non-toxic means in order to avoid creating new problems. That is not the case with our current Western Medicine approach of more and more toxic drugs with often horrendous side effects. Q: How does the Personal Portable Oxygen Bar-Concentrator work? The Personal Portable Oxygen Bar-Concentrator (PPOB) obviously cannot create oxygen from nothing. It removes nitrogen form ambient air. It releases nitrogen "enriched" air from the bottom of the unit. It pumps Oxygen Enriched Air (OEA) to the mouth piece of the head set. This means that the air around the Personal Portable Oxygen Bar over time will contain more and more nitrogen and less and less oxygen. In essence, the PPOB will become less efficient in producing Oxygen Enriched Air (OEA). A very simple solution: keep the air around the PPOB circulating. 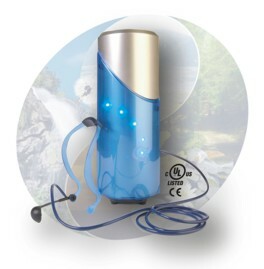 You may purchase the Personal Portable Oxygen/O2 Bar with Fan Assembly. Q: How loud is the Personal Portable Oxygen Bar - Concentrator (PPOB)? A: Approximal sound level 48 to 52 dB. Q: Is my Personal Portable Oxygen/O2 Bar-Concentrator satisfaction guaranteed? A: Yes, you have a 30 day (from date of shipping) money back guarantee. Simply go to the Contact Us page and email a request for a Return Merchandise Authorization (RMA) number, and send your Personal Portable Oxygen Bar-Concentrator back to us for a refund less 15%. Shipping charges incurred by us are deducted form your refund. No refunds with international orders. A: Your Personal Portable Oxygen Bar-Concentrator is offered with a 5% Discount PLUS FREE Shipping (You save $25.00 to $35.00 depending on your location in shipping charges by UPS Ground in the continental United States. For Express shipping, please contact us for a price quote. Q: What if I live outside the continental United States? A: Use the "Contact Us" page or call us toll free at 866-453-2021, ext. 1 for a shipping quote. Q: Is your ordering process secure? Note: Refurbished units at a special price of $495.00 plus $35.00 shipping available at times.